Green Coffee Bean Extract(GCBE) is derived from 100% unroasted premium Robusta beans that have undergone a proprietary extraction process and possess a composition that helps facilitate weight loss. GCBE’s chlorogenic acid profile has been proven scientifically to be highly bioavailable (easily absorbed by the body). This plant concentrate has no side effects and contains less caffeine than a quarter of a cup of coffee. 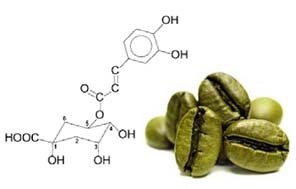 Chlorogenic acid is extracted directly from green coffee beans by destroying 70 to 98% during roasting.